In fact, Obama promised that there would be five million green jobs. Time Magazine wrote about a Green New Deal, as did the Economist (even if the latter wrote against it). Van Jones, who had authored a book called the Green Collar Economy, was named by Obama as Special Advisor for Green Jobs. But, while significant investments in renewable energy did occur—according to one estimate, the amount spent was $120 billion—the stimulus spending only lasted for a short while. Meanwhile, Jones himself was forced out before 2009 had come to a close. By 2010, austerity had already begun to replace the largely thwarted Green New Deal. But, as a common refrain has it, American is (or at least can be) a land of second chances. Could the promised Green New Deal of a decade ago finally arrive? Writing in the Intercept, author-activist Naomi Klein makes the case. 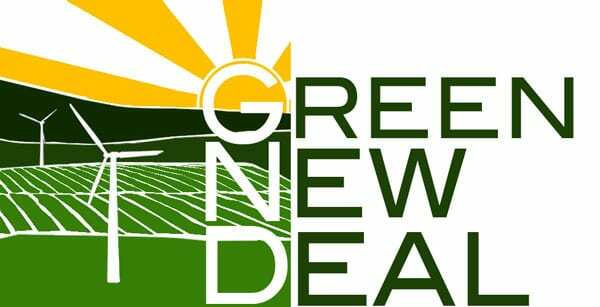 The idea, she says, is “for the Democratic Party to use its majority in the House to create the Select Committee for a Green New Deal.” To date, 17 representatives have endorsed the measure. The draft text calls for the committee…to map out a “detailed national, industrial, economic mobilization plan” capable of making the US economy “carbon neutral” while promoting “economic and environmental justice and equality.” By January 2020, the plan would be released, and two months later would come draft legislation designed to turn it into a reality. As Meyer notes, “the single most crucial aspect of the Green New Deal is its proposed job guarantee, a controversial policy that says that every American can have a job with the government if they want one.” This is critical, Meyer notes, because employment security would be a clear benefit that people would jealously defend—much as they did defend the right to health insurance for those with pre-existing conditions, protecting Obamacare against repeal. It’s the spring of 2043, and Gina is graduating college with the rest of her class.… Her parents availed themselves of some of the year of paid family leave they were entitled to, and after that she was dropped off at a free child care program. Now that she’s graduated, it’s time to think about what to do with her life. Without student debt, the options are broad. She also won’t have to worry about health insurance costs, since everyone is now eligible for Medicare. Like most people, she isn’t extraordinarily wealthy, so she can live in public, rent-controlled housing…. Utilities won’t be an issue, either. Broadband and clean water are both free and publicly provisioned, and the solar array that is spread atop the roofs of her housing complex generates all the power it needs and more. Since taking office in January 2017, the Trump administration has attempted to reverse at least 60 environmental rules, with 29 rules already overturned, 24 rollbacks in progress, and seven rule rollbacks in limbo so far.